My good friend Scott is probably the fittest person I know. He works out at least once a day (sometimes more) and eats like a champion. A little while back, I was in Toronto and staying at Neil’s place (author of The Book of Awesome). Scott came by and took us to the gym for a personal training session. At the end, I was beat and he hadn’t even broken a sweat. Then he said, lets do it again! I thought he was joking, I really did… but he was not. The point is, Scott is very fit and extremely well read. When I asked him what book I should read to learn more about nutrition, he suggested this book. I’ve been reading it off and on for a couple weeks now and it’s a great book. I found the section about fats very interesting. Of course, most people realize there are good fats and bad. Fats that your body needs and fats that your body shouldn’t have. But, there was an interesting little trick for identifying fat that is not itemized on the nutritional label. If you look at “total fat”, that number is often higher than the itemized fats listed below it (at least saturated and trans fats must appear itemized in the US since 2006). If you add up the saturated and trans fats and the subtract that from the total, you’ll know the approximate amount of unsaturated fats. The reason I say approximate, is because the trans fat number is regulated to be inaccurate in some cases. I mentioned in an earlier post that nutritional labels are not accurate, but in some cases the FDA actually requires them to be inaccurate. That might sound strange, but in this document, the FDA states, ‘If a serving contains less than 0.5 gram, the content, when declared, must be expressed as “0 g.”‘ So, if a food contains 0.49 grams of trans fatty acids per serving, the manufacturer must indicate the trans fat content as 0 grams. Look at the nutritional label picture I have included above. 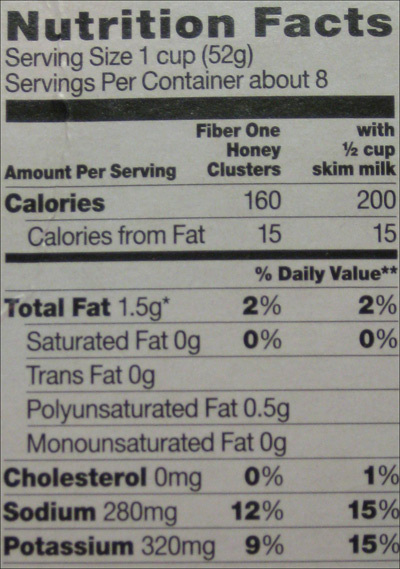 This label is from Fiber One cereal. The total fat is 1.5 grams per serving, but if you add all of the itemized items you only get 0.5 grams. That means, 1 gram of fat is hidden. If it was all monounsaturated it wouldn’t be so bad, but it can’t be more than .49 grams of good fat or it would have to be listed. Therefore, we know there must be at least .51 grams of bad saturated and trans fat present. According to the Mayo Clinic, your body can benefit from unsaturated fats: lowering risk of heart disease by reducing cholesterol and coronary artery disease. Nuts and seeds are good sources of unsaturated fats, along with salmon, mackerel and herring. Many vitamins are also fat soluble, meaning they require fat in your diet to be digested. The Mayo Clinic suggests you avoid saturated and trans fats found in margarine, many baked goods (hydrogenated oils) and fried foods. Entry filed under: Around The House, Demystified, Food and Drink. Tags: diet, fat, Food and Drink, monounsaturated, polyunsaturated, saturated, trans, unsaturated.